Anthony Wong (黃秋生) had always imagined that when he visited his father’s grave, he would be crying with grief over the tombstone, all the while carrying fresh flowers. But often reality doesn’t quite match expectations, as he discovered on a recent trip to Australia to pay his respects to his late father. The 57-year-old actor was raised in a single-parent household by his mother, after his father, Frederick William Perry, left them when he was just 4 years old. Last year, Anthony drew worldwide media attention when he uploaded an old childhood family photo of himself with both parents in a bid to locate his father. The story was picked up by the BBC, which resulted in the actor successfully finding and meeting his twin elder half-brothers, John and David, for the very first time. His brother explained that as it was very expensive to organize a traditional burial for their father, in the end it was decided that they would lay his ashes to rest in the garden. It was so informal that the grave is not even marked with a name. 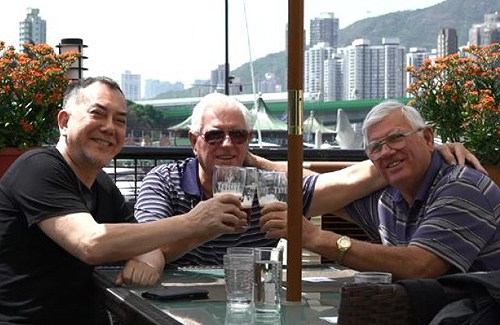 According to Anthony, there was no opportunity to feel sad or grief at the time, and he and his two step-brothers ended up paying their respects by raising a beer to where their father was buried. He admitted that if he was any less sensible, he might have even laughed out loud at the situation. The twin would be his half-brothers not step. How sweet, the blood brothers’ arm holding each other.